I wasn’t sure if I’d done a quick stats piece at the end of the last year’s League campaign – like the one I’ve been doing every year after the FBD is over – but I checked earlier on and I did (it’s here). Which means it’s time for a similar piece on this year’s League. Which, in turn, is the purpose of this post. I’m all for continuity of analysis, as it makes for easy comparison on a time series basis. Here, then, is this year’s table showing who played for us and against whom (a tick means a place in the first fifteen, S means an appearance off the bench) and who scored, with scores from play listed separately. That table above contains 30 names, which means that the number of players used in this year’s League campaign is well below last year’s figure of 36. Greater continuity is also apparent in the number of players who lined out in all seven matches. This year seven players did so – Fergal Boland, Colm Boyle, David Clarke, Paddy Durcan, Keith Higgins, Kevin McLoughlin and Cillian O’Connor – while the corresponding number last year was four. Four further players featured in every game this year. Stephen Coen (four starts), Andy Moran (6 starts), Conor O’Shea (3 starts) and Donal Vaughan (5 starts) fall into this category. Another three featured in six out of the seven matches. These are Danny Kirby (4 starts), Diarmuid O’Connor (2) and Tom Parsons (5). Had Danny and Tom not been suspended for the Roscommon game due to events down in Tralee, they’d most likely have featured in all seven matches too. I’m not sure if this means anything but the same number of players – fourteen – made six or more appearances (either starting or coming off the bench) for us over the seven League matches played both this year and last. The devil’s in the detail, though, because, as mentioned above, the number of players starting all seven games is higher this year compared to last (7 v 4), while the number featuring in all seven games is higher too (3 v 2) whereas the number of players lining out in six of the seven games is lower this year compared to 2016 (4 v 8). As I said, though, I’m not sure that stats amounts to much in the scheme of things. Three players saw their involvement this year restricted to just one appearance each off the bench. (The corresponding number last year was four). Eoin O’Donoghue got significant game time against Kerry in his sole appearance but both Liam Irwin and Neil Douglas only made it onto the field late on, against Roscommon and Cavan respectively. Our leading scorer this year was Cillian O’Connor, who contributed 2-32 to our aggregate League total of 3-89. Both goals were penalties and all bar six points came from placed balls. Cillian’s total of half a dozen points from play was surpassed by Andy Moran (who bagged eight in total) and was equalled by both Lee Keegan and Tom Parsons (the latter with 1-3), who, together with Kevin McLoughlin (the Knockmore man scored five of his six points from play), ended as joint third highest scorers for us in this year’s NFL. 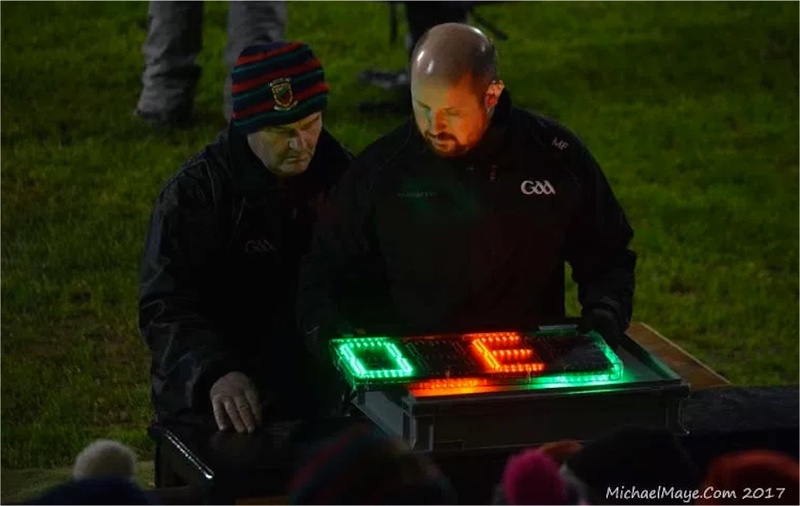 By the way, if stats are your thing then Edwin McGreal has two good pieces in this vein in this week’s Mayo News – here and here – which should be of interest to you. 1 goal from play. Yikes. Nobody scored on average more than 1.5 points per match. Yikes. For anyone interested, Lee Keegan is on Off The Ball tonight. No idea what time he’s on but they usually podcast the programme straight away after. Lee is up next on Off The Ball. Of the 30 players used in the league, 5 have since departed, leaving 25 used players remaining with the panel at this point in time. Given that the championship panel is likely to be around the 33/34 mark, it will be interesting to see who else will be included. Likely reinforcements to make up of Hennelly, SOS, Caff, Moran, Dillon, Crowe, O’Donoghue, Reape. 45 – I think Adam Gallagher is still on the Panel as well, I would like to see him getting some game time. Willie Joe, Stephen Coen is listed twice on the above table, listed as starting the Donegal game and also coming on as sub. FDB – good call – totally forgot about Gallagher. Just noted in WJ’s list that O’Donoghue was already there as he played part in the Kerry game so maybe Gallagher takes up that remaining place. Thanks, AndyD, for pointing that out – I’ll sort the table out in the morning. Too late to go sorting it now! These stats and Edwin McGreals article on the Mayo news are shocking and reflect bad on our management team.Very few players tried in the forwards during the league. Neil Douglas and Liam Irwin Brian reape and Adam Gallagher getting no game time.Conor Loftus just one game and 2 as sub.Alan Freeman leaving panel in February a massive loss and now Douglas too.Enda Varleys form with Vincent’s wasn’t even rewarded with a call up.Cathal Carolan dropped who still has a lot to offer in my opinion.Contrast that to Kevin Walsh who has brought back and shown faith in Sean Armstrong and Michael Meehan and Michael Lundy and rewarded younger players like Michael Daly Barry Mchugh and Ian Burke with games.Galway I think are going to be a huge task for us in June in Pearce.Alot of improvement needed in the forwards between now and then. Mayo87, the Douglas situation does baffle me, how the top club forward in Mayo cant make the panel, a player who obviously puts alot of work into his game, who then kicks 9pts after being released. It is worrying so little was tried out in the forwards. In saying that there is potentially more options available to last year. Fergal Boland played virtually every league game so must be in the managements plans. Adam Gallagher is a player who can make an impact, Loftus is fit to play, Brian Reape has to be a real option to play this year, hard to justify a player being on a panel for a second season and now being available to play. IMO the real find in the league for a forward position is Danny Kirby, he showed that he is well capable of scoring. He played in midfield in the league but I can see him starting at ff in the summer with AOS finally returning to his most influential position of mf beside Tom Parsons. Mayo87, Surely Mayo management have to be taking form displayed in training into account in selecting teams. There is little point in picking a player who is not showing form in training in the hope that he will turn into a marvel on match day. Have any of those you listed shown the required form at club level? Douglas has to some degree but only to some degree but when given the chance at county it has not been apparent. Boland started the year with a great florish but as the league progressed his influence declined as did his scoring returns. Two points from seven starts is just not good enough. Nor does he appear to have the workhorse attributes which partly compensate for some of our other forwards low scoring returns. Nally although normally a defender looked to have more to offer in attack than Boland in the last few league games. He could have a key role in covering back for Keegan when the latter attacks, as he must keep doing if we are going anywhere. If Seamus or Aiden O’Shea come into our midfield I would have no hesitation in moving Danny Kirby into our attack, whether as a wing forward or full forward. Conor O’Shea also seems to offer more in attack than Boland. Whether Keith Higgins can offer more in attack and whether he can be effectively replaced in defence is another issue to be considered. One thing which seems to be clear as regards playing Dublin is that their defence does not like players running at them. Cian O’Sullivan might not be as happy in his covering their full back line if Keith were centre forward. Boland has been alrite but is another working forward shot 4 points in the entire league nothin that wud scare the likes of dublin or kerry.Kirby has been impressive wud defo be an option at full forward as he doesn’t have the legs for a Brian Fenton or Jack Barry in the middle of the park.Shane Nally has been very impressive uses the ball really well great foot passer. 1 to 9 on our day wer as gud as Kerry or Dublin .But I am just disappointed in that we haven’t tried or best inside scoring forwards in the county. Enda Varley shud have been brought back in and Cathal Carolan who is by far one of the best club players in the county.be interesting to see which 6 forwards start against sligo in May. Lads, if Alan Dillon has made the championship panel after not playing one minute of the league, what does that say? Either that he has a special status in the panel, or that the rest of the forwards are not up to scratch. Seriously folks, wake up and smell rhe coffee because it has to be one or the other. AndyD, I would agree with you that management make their decisions upon training and you would have to trust their judgment. I would say Douglas has more than to some degree shown at club level that he is capable, consistently outscored most if not all county panel forwards over the past few seasons. He didnt get an opportunity last year and got injured in the fbd this year so limited opportunities. I trust the managements decision but I think Douglas is definitely a player worth keeping around. Personnally id rate him higher than some players already in the panel. Martin, I would tend to agree with you Regarding Alan Dillon, a true legend but has been a bit part player for the past few seasons, I find it hard to see him keep a spot after missing the league and training, with others fighting to be included and others released. Cathal Carolan is at this stage Crossmolinas 4th best forward. Loftus, Duffy and Benson do most of the scoring. Young Flynn will be closing in to possibly be their 4th best forward soon. So it really isn’t true that Cathal Carolan is one of the best forwards in club football. He hasn’t looked as strong since coming back from injury. Enda Varley was tried for mamy years. We know his ability very well. He’s not going to make a big improvement in his 30’s. If he was a young 23 year old maybe but you don’t improve too much in yer 30’s. JP, while I was never a fan of Varley when he was with Mayo, he seems to have improved with Vincents and was one of their top scorers, maybe Willy Joe can confirm this? He may be worth another shot as we are seriously lacking with scoring forwards and he has a good left foot on him and he was taking frees for vincents. I think management should take a serious look at him forthe championship. I think some people would want to take a leaf out of Keegan’s book and not keep blaming referee’s. Reasons for failure lie closer to home. Small correction to the stats above but Andy Moran scored 0-8 in the league all from play. Mayo Mad it was the same years ago with Billy Fitz —the best club forward in Mayo but only made the Mayo team when he was past it. Has been frustrating watching Dublin, Kerry and indeed Galway throwing in and trusting youngsters during the league – I think we have really missed an opportunity during the league once again. We are the county above all that need to be blooding new players, particularly in the forwards. Kerry have a new batch that have now won a national title vs. the mighty Dubs – invaluable experience. I have seen a good bit of Kerry in the league and some of those players looked raw and needing a bit to go, but as the league progressed they have gained confidence and adapted to the requirements – that is the process of blooding new players. I actually found it depressing seeing these Kerry fledglings grow in stature last Sunday – what have we learned? That Andy Moran is still good? Drake and Nally have got more game time in the forwards than Douglas, Loftus, Reape, Gallagher or Irwin. Can’t expect now that they can make a big difference in the championship and we will have to revert to type. The Sligo game is the last chance to try out a few of these lads. Thanks Conor C, I’ve corrected that now, along with the double-entry for Stephen Coen that AndyD spotted last night. If anyone else identifies any further errors in the table, let me know and I’ll make the necessary corrections. We have been banging on for long enough about a forward coach I think Alan Dillon would be ideal in that role maybe that’s what management are thinking themselves…. Folks – I get the need to blood youngsters but they have to be better than whats available. Conor Loftus was shooting the lights out at the under 21’s but it’s a very different level – if you look back at his scores at under 21 last year they were phenomenal, but they were against under 21 opposition. This year he’s had some opportunities and scored 2 points, if I’m not mistaken both against Roscommon, which lets face it, that was a Turkey shoot. So was Irwin, but aside from the rumours of his discipline, the lad is not blessed with pace and it’s not like we have an abundance of slow forwards already. Boland has been given plenty of game time and did well in the earlier games, but not as well in the latter part. I can see Doherty getting the nod ahead of him when Jason is back to full fitness, simply because Jason has a wiser head on him, and is less likely to have to be taken off after 50 minutes. If we were to look back at the scorers from the Under 21 final last year, it was Irwin (2-2), Loftus (2-2), Diarmuid (1-0), Plunkett (0-2) and Ruane (0-1). Out of our score of 5 -7 on the day, Irwin and Loftus got 2-2 each, leaving 1-3 for the other 3 scorers. Against Dublin there was a wider spread, Akram, Duffy, Ruane, Coen, Boland, Diarmuid, Irwin and Loftus getting scores. Akram – still on the under 21’s – I think this lad is an amazing talent and has a bright future, but it’s too early for him to get the nod over the current squad. Duffy – a bit on the heavier side, not blessed with pace anytime I saw him play – we’re blessed with an abundance of non-pacy forwards. Irwin would be ahead of him in terms of talent in my view. Ruane – has been injured, still on the under 21’s, I don’t see him as ahead of Parsons, Seamie, Barry or Kirby in midfield. Coen – has his place on the senior squad. Irwin – had his place on the senior squad, need to work to get it back. Reape – didn’t score in the Semi, was injured for the Final. Very few under 21s break in so easily to the senior squad – we have been blessed that Diarmuid and Coen have done so – both are amazing talents and have merited their continued presence. Note however that both have the stamina and the physical attributes to do well at senior level. Many of the under 21s from last year have been given game time in the FBD or in the league – and many have since been released back to their squads. Where are all these other young lads that need to be tried out?. KL, you made a good point regarding Nally and Drake getting more time than a number for forward options. Add to that the calls for the likes of Keegan, Durcan and Higgins to be added to the forwards which is actually worrying. At this stage I really think there is a problem with the structures in place at underage that is hindering the development of natural forwards. There are decent player coming through but none you can say are natural scoring players. Last years U21 showed great spirit and determination but their point scoring wasnt the highlight of the campaign. I think the coaching at underage is too much based on developing players for the running game as opposed to nurturing natural skill and ability, I dont think enough emphasis is put on the actual skill side and just kicking balls over the bar. For example Tyrone cant develop decent forwards as they are all set up for the defensive style of play, Mayo are set up for a running style of game where the emphasis is on ball carrying and retention. The only county to continually produce class forwards is Kerry who nurture the skills of the game from a young age. Until Mayo start developing forwards from a young age then nothing will change, now and a again a gem will come through but not a enough to build a team around. Good post FBD. Diarmuid and Stephen Coen were always going to be the two who would be physically ready for senior football the quickest. They are naturally stronger taller guys with mobility. People are forgetting about the injury crisis that hit that 2013 minor team. Conor Loftus won’t have been able to do the heavy strength work on his legs with all those injuries he has had up to recent. You can see it physically that he has a bit of bulking out to do on his legs. Hence I think he will have a major lift in his game once he can get this done, but it will take probably a year. Mayo did a review of the 2013 minor injury crisis and have taken a step back from how hard that team was pushed. Damien Gavin the Mayo minor manager said his focus is on holistically developing senior players for club and county, his focus is not on winning titles, something he has stated in interview. If you look at last years minor team there are no reported overuse injuries that I have heard of. Colm Murphy suffered an injury versus Galway but it wasn’t like a hamstring. We don’t know which players by 21/22 will bubble to the surface as being a player who can make a difference. Conor Diskin a player not really heralded at minor. He was the game winner versus Aghamore at the weekend. James Lyons a classy player who can score goals and take a score when he has space. For sure he suffers a bit now as he is tall and languid and not the most powerful. But where will he be a stone heavier at 22 or 23? He might be a strong club player he could be in with Mayo. Conor Stenson another languid tall player, Johny Maughan same build. Donovan Cosgrave. I have nor no one has much insight if these are going to be strong club players or players who can compete at senior intercount level. But the approach I think now is the correct one. – They have pace or that kind of rangy pace like Colm Murphy/Nathan Moran/Johny Maughan of taller lads when they are into their stride. – The soloing, passing and shooting all look fine. We have been deservedly beaten by Galway last year. But let’s see, there’s several years to go to see which ends up being the more successful side. FDBinashui – my point is that if you don’t give them adequate time you don’t know. Kerry gave theirs proper time and are reaping the benefits/ Successive management are fearful of moving on from what has got us to successive semis / finals – however we have ultimately failed. These lads WILL be playing for mayo in years to come when the older group move on because they are the cream of the crop, so we should trust them more now. KL i think the issue with Kerry was that hands were forced to blood the youngsters due to retirements, and their dependence in the last few years of older players since departed. We’re either fortunate or unfortunate in that our best players are still on the squad, and not yet retired. I would agree that the youngsters need to be given game time however many of them have and haven’t done so well, or some have and have been retained. Our loss to Cavan meant we had to play our tried and trusted against both Tyrone and Donegal. Neither game warranted experimentation as we had to win both – at least when the teams were being picked – to retain Division one status. If we had beaten Cavan, we may have had the luxury of trying some of the young blood, but coulda woulda shoulda and all that. I do agree however on our lack of forward talent – whether that’s a matter of nature or nurture, I don’t know. We are too reliant on Andy and Cillian to get our scores from the forwards, and it’s telling that Leeroy and Tom Parsons outscored most of our forwards in the league. We do appear to have a better pick now as the league has ended as many of the stalwarts return from injury. The sooner all are back to full fitness, the better. Interesting points there FDB and also the responses. Like KL game time is hugely important, and Loftus has got damn little this year. BTW, Loftus got a screamer of a goal in last year’s (SENIOR) league against Monaghan, so he is capable when the chances come. It’s all about entries in the log book and it will eventually begin to pay off. I see Coen has been noted in the Examiner as one 10 players from all counties to impress in the league. But Coen, had seen game time in 2015 as a bit player, and bit by bit has started to make his mark. In that sense management see potential in Boland and have given him a lot of game time. He will have benefitted hugely from that. I think Conor Loftus will have to start against Sligo. We can afford to rest Andy, and get championship time for Loftus. And we don’t need to worry unduly if he doesn’t set the world on fire. I don’t think there is something missing from underage. We haven’t had strong midfields on all our teams including 2013 minors. Colm Murphy is the only midfielder who I thought stood out at minor level. Without a dominant midfield your inside line suffers. If you look at last years minors, Colm Moran could very well develop into a good inside line player. If you look at this years minors you have Cathal Slattery, Tommy Conroy who are good players. Matthew Lenehan from Charlestown is free scoring but recovering from a shoulder injury. John Gallagher U17 is recovering from injury and free scoring. Conor Diskin is scoring heavy these days. Ryan ODonoghue is an intelligent player and a finisher. To say that management is usually right and wudnt leave anybody out is wrong.We had it with Maughan leaving Kevin O’Neill out during the 96 to 04 period.O’Neill was consistently top scorer in the county with Knockmore during that time till Micky Moran brought him back in 06.James Horan chose never to give Brian Gallagher Tom King and Shane Nally a fair chance during his time. Credit to Rochford for bringing Shane Nally back.But he could give young scoring forwards such as Loftus Reape Irwin and Gallagher a chance during the league.Andy Moran and Alan Dillon are pushing on in age and we shud be making plans for there replacements. 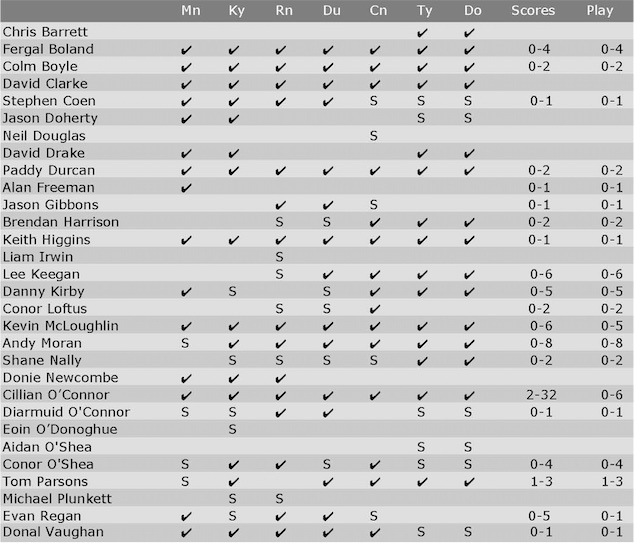 I’ve made a further revision to the table (and have had to do a small bit of editing to the text as a result) – Conor O’Shea came on as a sub against Dublin so he’s another one who played a part in all seven matches. Thanks to Ed for pointing this out. Perhaps shooting the lights out was indeed the incorrect phrase, and we do indeed already have a free taker. Willie. Joe,thanks for the enlightening statistics.To settle an argument could you please tell us how many mayo players played every minute of all nine championship games last year and how many did the same in all seven league games this year?My guess is 1 and 4 Happy Easter! You have the tools at your disposal to settle that argument yourself, Sutfol! The results archive here on the site contains full details of teams and subs used (so you can quickly work out who wasn’t taken off in any game) and all the details are there for both last year’s championship (here) and this year’s League (here) so there’s no need to be guessing about it. Once you’ve worked it out, you might post the answer here. I’d guess that Kevin McLoughlin would be the only one, I can’t recall ever seeing him being subbed to be honest. As regards the 4 one th eleague this year, imy guess is Clarke, Higgins, Cillian and the ever present Kevin Mc. WilleJoe thanks for the help..according to your records KH .was the only player to play every minute of all championship games last year.5 players DC, KH, PD, KMc and COC played full league games this year. Very difficult to work out exactly what we were trying to acchieve in both FBD and league. Indifferent performances including defeat to demoted Cavan team leaves us vulnerable. One game at time for championship, including our first outing. Unlike kerry, donegal and to an extent Galway, we have not matured our younger players. I do think some of the criticsm of Boland is unfair. He is potentially a great player, not his fault that he was overplayed in the league. We have to be patient re other young players. This summer campaign looks like we are going with the seasoned players with minimum changes in personel. As the stats suggest, we will be reliant on our half back line for many of our scores. If there was one good outcome of the league, imo, it exposed how much work we have to do in all sectors of the field, to get seriously competitive. I actually think performance in training is irrelevant. We cannot know how good a player will be until he is tested in a competitive game. In training the player needs to be of a certain standard but that’s it IMO , brilliant performance in training proves very little. As stated above we should be giving fringe players more time in the league and in the FBD , its a damning statistic that we are using less players than we did last year. I only saw Neil Douglas play a couple of times for Mayo in FBD and league but I thought he was of the required standard ( he was hindered in his chances by the mitchells great progress in the AI clubs ) , why has he fallen off the radar now ? it makes zero sense. We can only make decisions on players that we see in competitive matches , that is my humble opinion.